← Brazil Bugs #10 – A mosca mais legal que eu já vi! This week is Army Ant Week, and while Alex Wild’s stunning photographs of this diverse and charismatic group reign supreme, some of the cooler bug bloggers are nevertheless getting into the spirit of things with army ant posts of their own. I have no such photos, but I’m hoping I can sneak onto the bandwagon with these images of leafcutting ants that I photographed last month in Campinas, Brazil. These were among the first insects I saw during the trip once I got a bit of free time to walk the hotel grounds. Watching them crawl along the lower edge of the hotel wall was a welcome sight, as nothing says “tropics” to me more than columns of these ants carrying their bits of leaves back to the nest for use in their hidden fungus farms. 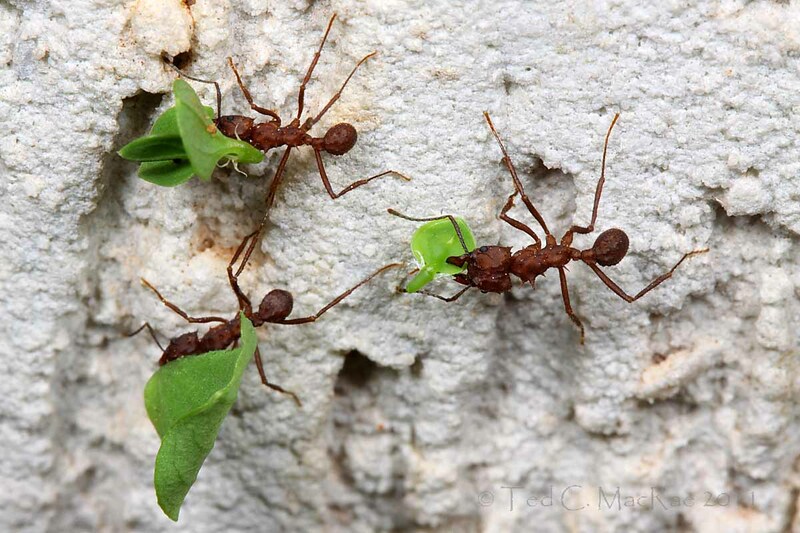 While taxonomically they may be unrelated to army ants, their precise single file marches in dutiful service to the colony are as military as it gets. 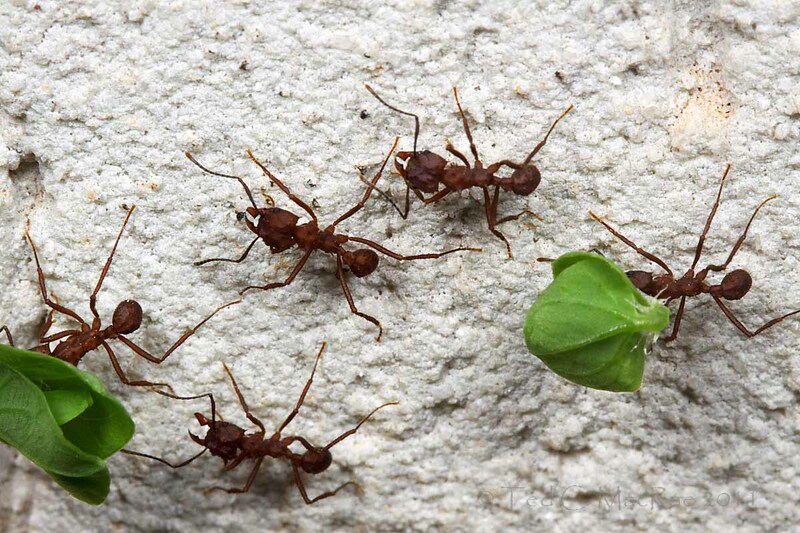 Army ants may have the jaws, but leaf-cutters have spines – they don’t just carry weapons, they are the weapons! The thing I like most about leaf-cutter ants is that they are one of the few ant groups that I feel confident enough to hazard an attempt at identification. Several genera comprise the group, and most people who are at all familiar with them think of the genus Atta first. However, I recalled reading something on Alex’s blog about spines as a diagnostic character for attine ant genera – sure enough, in this post Alex explains how species in the genus Atta have two pairs of spines on the promesonotum, while those in the genus Acromyrmex bear three pairs. On this basis, I’ll go out on a limb and declare the individuals in these photos as Acromyrmex sp. (of course, which species is another story – James? Alex?). If I’m proved right, it will confirm the worthwhileness of all my blog trolling. If I am wrong – well, there’s still nothing wrong with idle entertainment. This entry was posted in Formicidae, Hymenoptera and tagged ants, Brazil, Brazil Bugs, entomology, insects, nature, science. Bookmark the permalink. Indeed I know what you mean. My first trip to the American tropics many years ago found me outside a hut with a line of leaf-cutter ants marching by (at night). They had nearly defoliated a small shrub. Outside a hut at night? I’d like to hear that story. Pfaahh! Taxonomy fail! Perpetuating the public’s ongoing conflation of army ants, leaf-cutter ants, bullet ants, carpenter ants, and piss ants (most notably in this movie – http://www.moria.co.nz/horror/naked-jungle-1954.htm ). How could you? Seriously though, these are cool ants. I’ve never done any research on them (plenty of others to take care of that) but what a marvel of evolution! I know it was a stretch – I had to draw some kind of connection. Naked Jungle is one of my favorite sci-fi classics. I like the whole Myrmecinae subfamily – from the incredible spinyness of the attines to the spectacular jaws and bizarre heads of Acanthognathus, Pyramica, Strumigenys, etc., this group has got it going for those of us who love morphological extremeness. You could do Camponotus week. This is the most or second most speciose ant genus. One large (and fabulously aggressive) species in Argentina, C. rufipes, even cuts vegetation, to build nests in low vegetation of wet grassy or savanna areas, thus sort of qualifying as a leaf cutter. Yea, well we’ll see how much opportunity I have to look for such things in Argentina – this will be a somewhat shorter business trip with a more frenetic travel schedule.